This was one of my CHA pieces for the Cornish Heritage Farms booth. 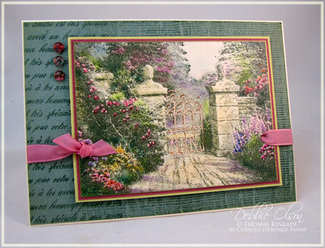 I used the Thomas Kinkade Open Gate image, stamping it in Versafine Olympia Green ink, then using my stamp positioner to overstamp in Versamark so that I could use Pebbles Shimmery Pastel Chalks to color the image. I typically use colored pencil on the TK images, and I found that chalking it was much faster! I accented with a waterbrush and some watercolors in a couple of places because my chalk wasn't quite dark enough. (I think I need the jewel-tone assortment next.) If you are a Technique Junkie Subscriber, Pat covered this technique in her 12/07 newsletter, Pastel Detailing. 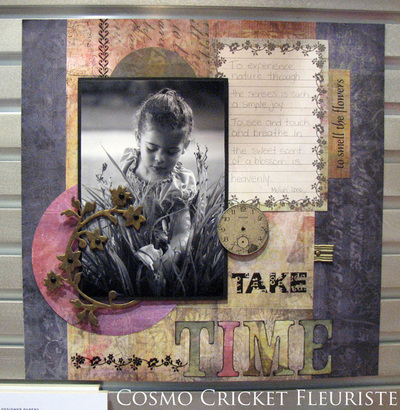 Background images are CHF French Script and Canvas stamps. Ribbon is white taffeta that I colored with an R34 Copic marker. Dew Drops are from the Poinsettia assortment. Cardstock is Poison Ivory and Prism Island Mist Medium, Frosted Kiwi, and Razzleberry Medium. 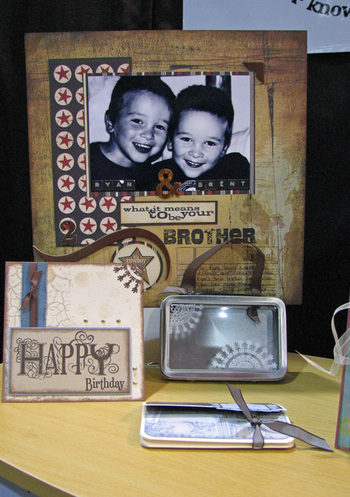 Today I have two more PaperTrey new releases for you. First, Shapes by Design, created for PTI by the talented Alli Miles. 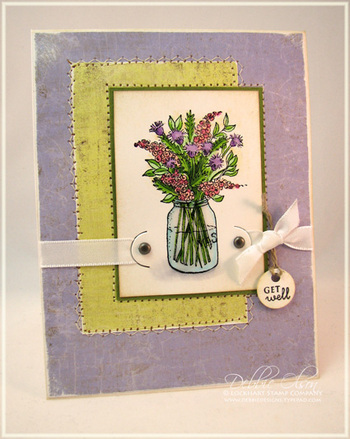 I used Aqua Mist ink on PaperTrey Stamper's Select White cardstock to create a patterned background, then layered 1/2" circles of stamped flowers on top of the background. 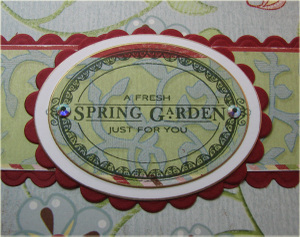 The ribbon slider is one of my new Spellbinders tag dies, due to be available in April. Ribbon is PTI Aqua Mist Satin. 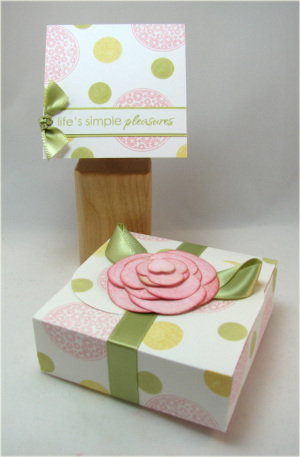 Next, I have a small decorated box and gift card. (The box is a die cut that someone gave me; it may be an Accucut; I'm not sure.) 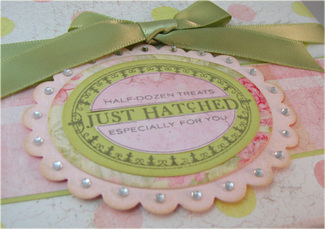 I used PaperTrey Spring Moss ink, along with Ranger Adirondack Shell Pink and Lemonade. The flower on top of the box is a Spellbinders die cut, layered with foam tape, and with leaves made from Spring Moss taffeta. Gift card is 3" x 3". 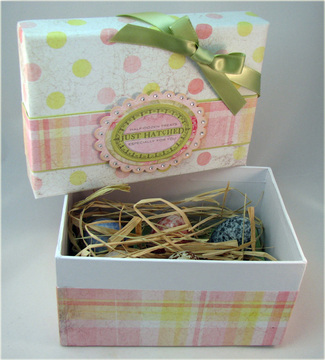 Next, with Polka Dot Basics I covered a small square clear-top tin packed with Jordan almonds, and included a gift card that also uses the Women of Life and Shapes by Designs sets. 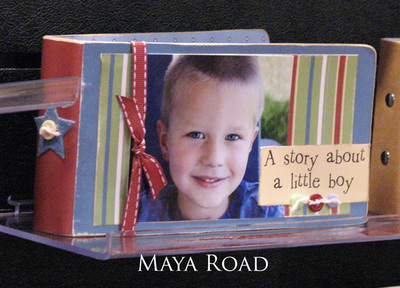 The scalloped card was cut with a new Spellbinders Long rectangle die and folded. (Again, these will be available in April.) 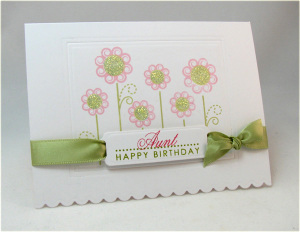 I used Diamond Stickles on the inside of the flowers, after stamping them with PTI's Aqua Mist and Spring Moss. These were really fun sets to work with! Thanks for visiting. 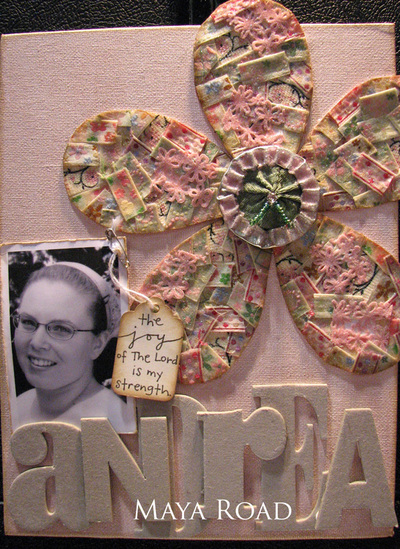 Melissa Bickford created a lovely and useful set in PaperTrey's new Women of Life! My card uses the set as it was meant to be used, complete with the woman-label, aunt in this case. I used PaperTrey Stamper's Select White cardstock and embossed it with my Spellbinder's Nestability Classic Plain rectangle die according to the instructions that Nichole posted here. 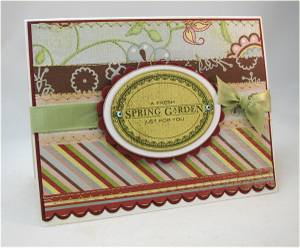 I also used one of the new Spellbinders Long Rectangle dies to scallop the bottom of the card, and one of my new tag dies to create the ribbon slider--both released at CHA and soon to be available. Ink colors include PaperTrey's Spring Mist and SU's Pretty in Pink and Regal Rose. Ribbon is PTI's Spring Moss Satin. 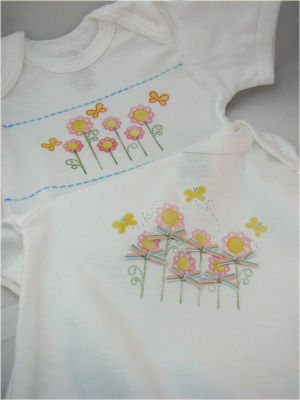 The flowers were so darling that I had to try some onesie-stamping with them. I tried twice, and I'll show you both versions at the end. I like the beribboned version better, but I'll keep the other one too. A sweet baby girl can never have too many flowered onesies! The first version is stamped with assorted Palette inks. I used a Copic teal multiliner to make butterfly antennae and trails. On version two (behind version one), I used some SU craft inks and heat set them. 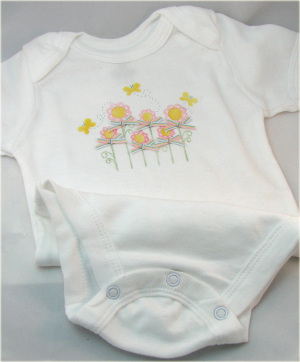 In addition to the Women of Life set, I used the PTI Faux Ribbon set for the dotted stitching on the back onesie. I'll try to get the rest of my PTI posts up tomorrow. My family could use some attention tonight. Thanks for visiting! 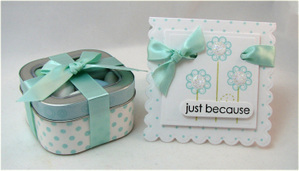 Nichole asked us to keep the Everyday Blessings cards simple to reproduce, and that's what I did. My first Everyday Blessings card is a standard A-2 size, stamped on brushed gold cardstock with Versamark and heat embossed with detail gold embossing powder. 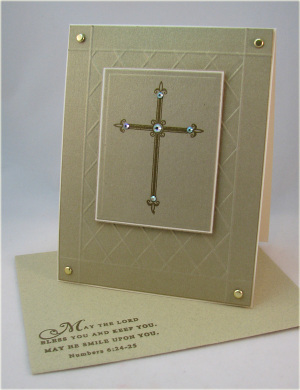 I accented the cross with iridescent Swarovski crystals after cutting and embossing my image with a Spellbinders Classic rectangle die and matting it with ivory cardstock. 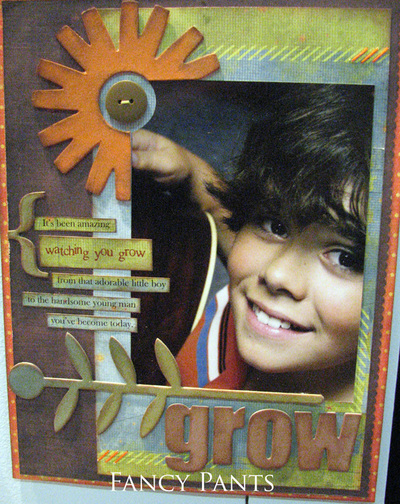 I used my Scor-Pal to emboss a patterned background. (You can find instructions here if you missed them earlier.) I heat-embossed one of the verses in the set with detail gold EP on the front of my brushed gold envelope. (I've had these for quite a while and can't remember where I got them--sorry about that!) That's it--simple and elegant. 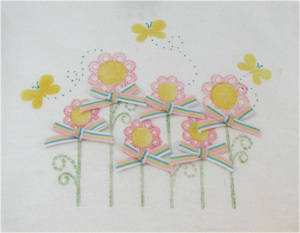 My second Everyday Blessings card is 4-1/4" square. I created a patterned background by using the small cross in a repeating pattern with the Aqua Mist ink. I don't have my PTI Aqua Mist cardstock yet, so colors are a bit off--the closest I could come with trying to ink some paper. 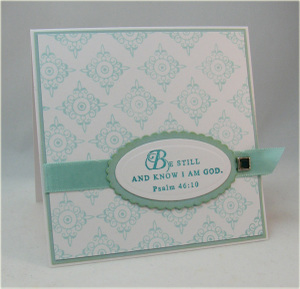 I used my Spellbinders Petite Oval Nestabilities, both plain and scalloped, to create the medallion that contains the Bible verse. Brad is an SU brad, re-colored with a Copic marker to coordinate. You can't see it well in the photo, but it is a darker aqua color that works well with the Aqua Mist ink. I used a Versamagic Turquoise ink to stamp the verse. More sets to come later this evening! Just a note: if you have e-mailed me in the past few days and are awaiting a response, I'm just starting to sift through several days of e-mail after getting in from CHA at about 1 this morning. I'll get to it as quickly as I can, and thank you for your patience! I want share a few pieces from the new PaperTrey Ink releases today; I'm still trying to get things uploaded into the PTI gallery and having a few glitches. So these will eventually be over there as well. First, how about another Just Hatched ensemble? 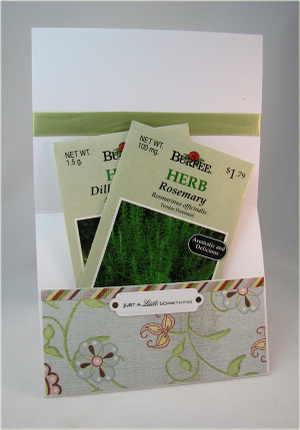 For this one I covered an egg box and made a coordinating card that is a seed packet holder as well. 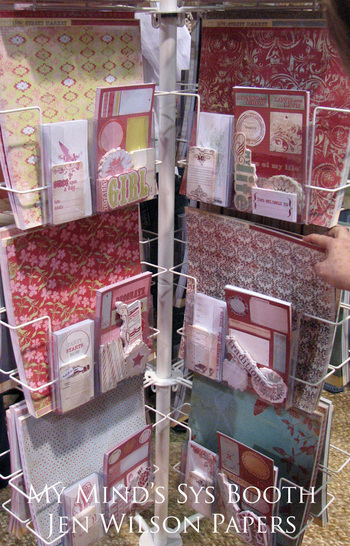 Patterned paper is by Scrapworks, and burgundy paper is Prism Blush Red Dark. 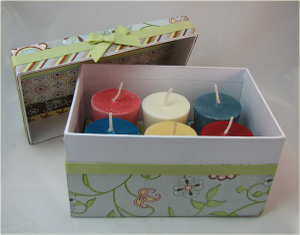 For the contents of this box, I chose scented soy candles that coordinated with my patterned paper colors. For the box cover, I used my Spellbinders Nestability Classic Plain and Scalloped ovals to make my focal point medallion, and accented with some iridescent Swarovski crystals. 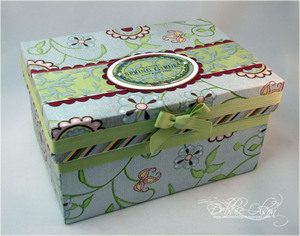 I used PaperTrey Spring Moss twill on this box--such a soft, silky texture! 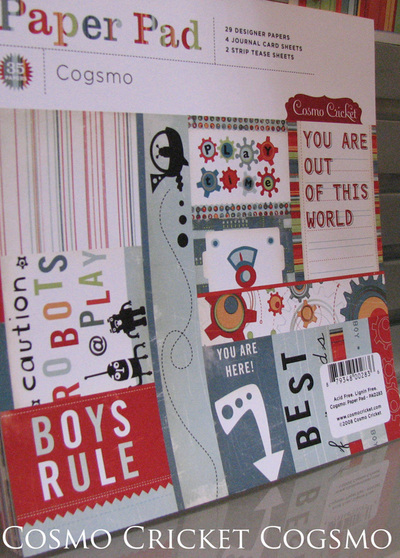 For the card, I cut my cardstock to 5-1/2" x 11", then scored on the long side at 4-1/2" and 8-1/2". That small flap was then folded up to create a pocket for seed packets. The scalloped bottom was created using a Spelbinders Nestability Long Scalloped Rectangle, a great nest of dies that will cut cards up to 6" long! It should be out soon--it was a new CHA release. Ribbon on the cards it PTI Spring Moss Satin ribbon--soft, silky, and wonderfully TIE-able! 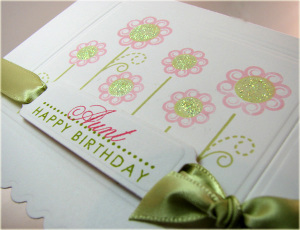 See the little tag die cut on the inside of the card? That's MINE, newly released at CHA! 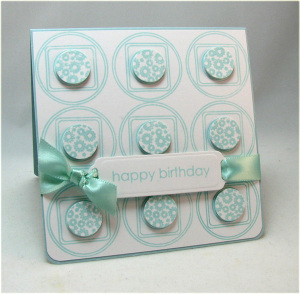 :-D It's one die of three from one of my four new sets of Spellbinders tags that I designed just for cardmakers. This particular one has 1/8" holes for eyelets or ribbon. 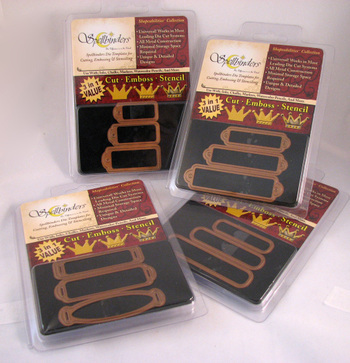 Another set has three dies with holes sized for 3/8" ribbon sliders. Set three has three tags in small, medium, and large, and the last set is simply a rounded rectangle in three sizes. As much as I use and love my SU word window punch, I am always needing something in larger sizes, so I'm hoping that some of you find it helpful as well. I will be posting different sets in different posts, so feel free to check back later if you wish. This post will stay at the top since it has some explanatory material in it. Thanks for visiting! Today I get to share with you a sneak peek of one of the new PaperTrey sets, and tonight at 12:00am EST is the BIG reveal! I chose to use the new egg boxes along with the Just Hatched stamp set. 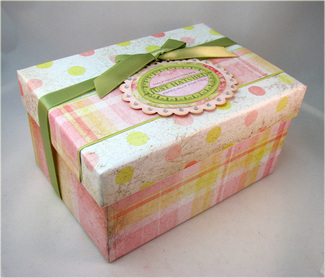 I covered my box with paper from Daisy D's Lullaby Collection, and I incorporated the new PaperTrey Spring Moss satin ribbon to tie the box shut. The satin ribbon ties beautifully--you're going to love it! To make the label, I stamped the Just Hatched label in Versafine Olympia Green Ink, then used my Spellbinders Oval Nestabilities, both plain and scalloped to make my label. I added some Hero Arts clear Rhinestones to each of the scallops in to tie in with the elegance of the Just Hatched label. 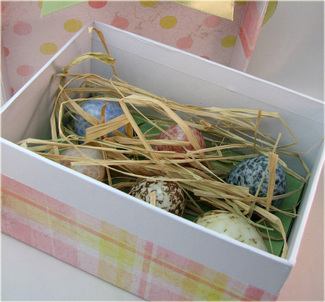 The real challenge was to find something that I loved that would be perfect for my box; when I found a set of ceramic eggs, I knew that they were box-worthy. I painted the egg holder insert with a spring green paint and used raffia to make a nest for the eggs. This was such a fun project. I can't wait to see what others do with these fabulous egg boxes! 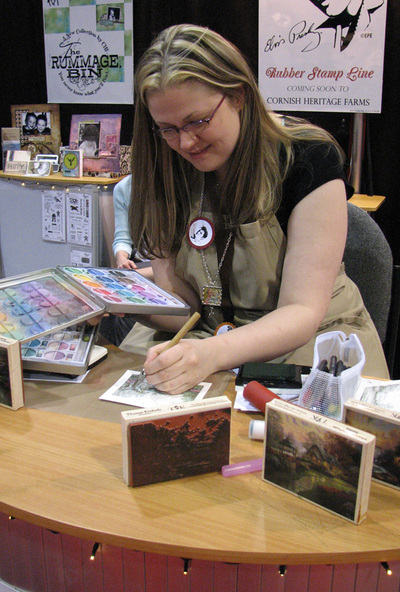 Today was a pretty busy day; I worked at the Copic booth from 10-2, and the Cornish Heritage Farms Booth from 3-5:30. Liz let me go about 10 minutes early so I could quickly take some photos for you to enjoy. 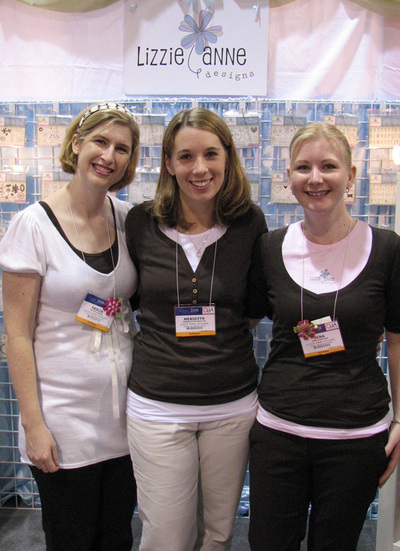 First, a few people in action: Meredith, Tricia, and Zena were working in the Lizzie Anne Booth, and they blessed me with my very own set of Jolie Fleurs! Next, how about that Lisa Strahl? She's a Cornish Heritage Farms stamping powerhouse! I don't know that there's anyone in this industry whom Lisa does not know. Yesterday I met Kim from MFT and Diana from Scor-Pal, as well as countless SCS friends! 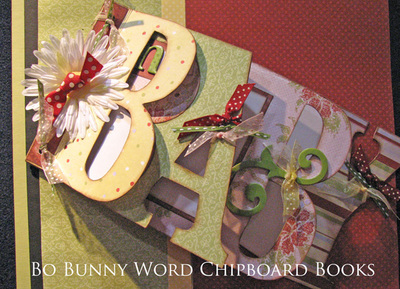 These little Bo Bunny word books came out a while back, debuting at Summer CHA, but I still love them every time I see them. 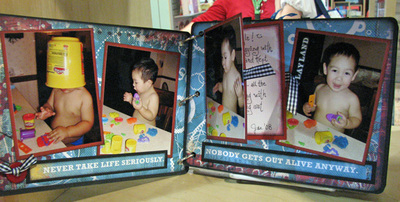 Next, check out this Fancy Pants scrapbook page. Isn't it lovely? And for you FP stalkers. here's another cool stamp set! See these cool new Marvy products? 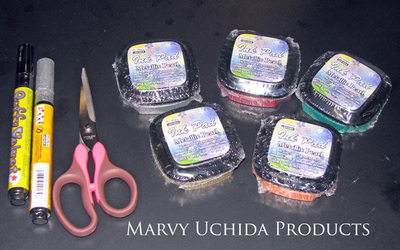 The inks are a metallic pigment ink that Lisa Johnson likes, as well as Marvy's new Squishy scissors and a couple of pens. Finally, I want to introduce you to the funniest stamp collection that I saw--Inkadinkado's kids saying line! I thought I'd dole them out singly. . .
Today was another good day; the Copic palette was delivered this morning just as the show opened. I sat there and colored for people while the others set up the booth. I met more cyber-buddies and had a great time. From about 1:30 until 5:30, I wandered the floor looking at lovely things--ahhhhh, the life! I tried to watermark the companies' name on each photo that the labeling isn't clearly visible on, and I asked permission in these booths to take pictures. 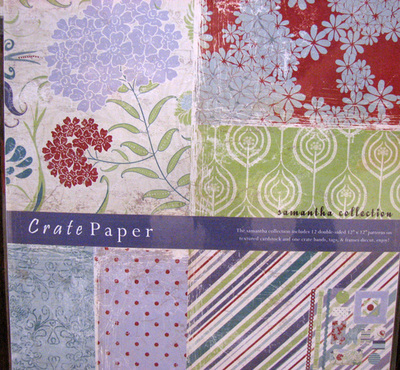 The first set of pictures here is from Crate Papers; Samantha is not a new release this show, but for some reason I had missed this one last summer. I love its colors, and I need it--"need" being defined in that stamping sense rather than the true definition! 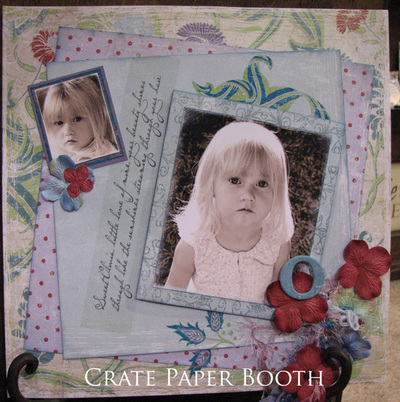 The fourth Crate picture below, Blue Hill, is a new release, and it is lovely too. 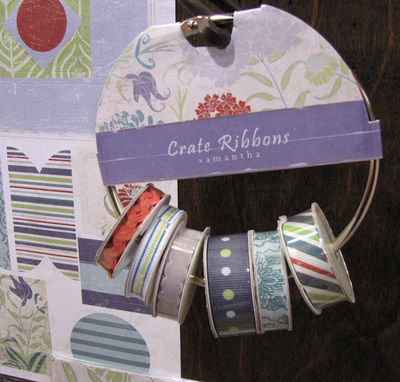 Next, how about some American Crafts ribbons? 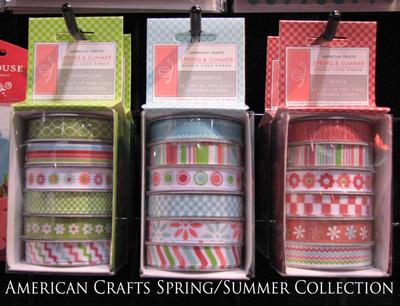 The American Crafts Spring/Summer Lines are delicious! 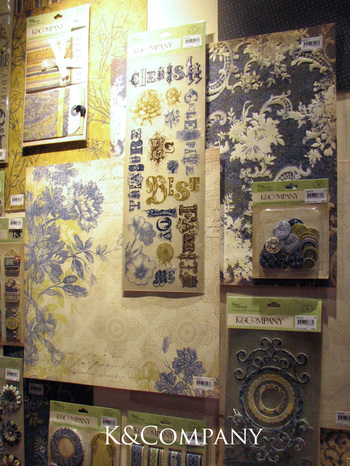 Maya Road always has a beautiful booth and great ideas, and this year was no exception. How cool is that ribbon flower? I'm seeing my ribbon trimmings in a whole new light now! 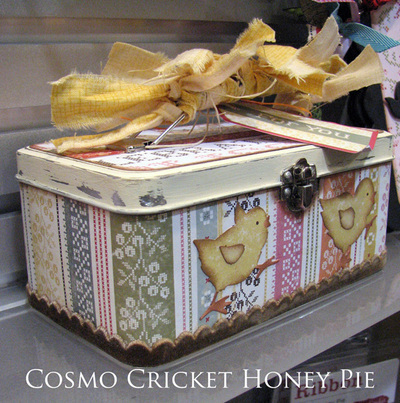 Finally, I want you to see what's new at Cosmo Cricket. 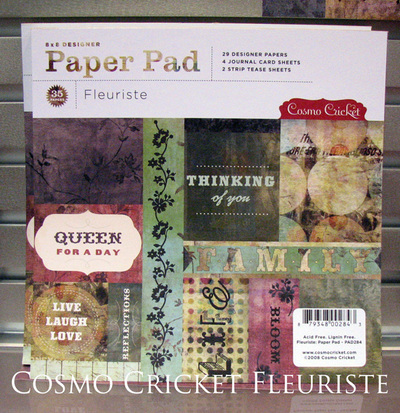 You know how much I love my Cosmo Cricket! Feast your eyes on some fabulous eye-candy. Ahhhhh. . . I'm in paper-love! I hope you enjoy seeing these as much as I have. Have a beautiful day! It was another gorgeous day here, especially considering how COLD it is at home in "da U.P." I didn't have a lot of free time to roam today for one reason or another, but I was able to get pictures at a couple of places anyway. 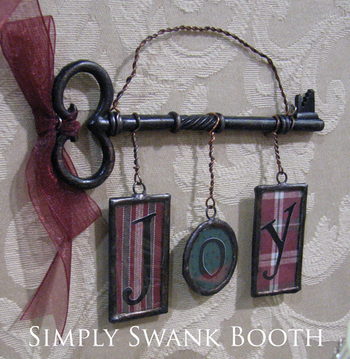 First I spent some time at Simply Swank's booth; I saw their booth last year and was totally intrigued with their glass jewelry, frames, etc., because of my love for stained glass. I have all of the tools that I need except for lead-free solder. (You really don't want to walk around with a lead necklace!) 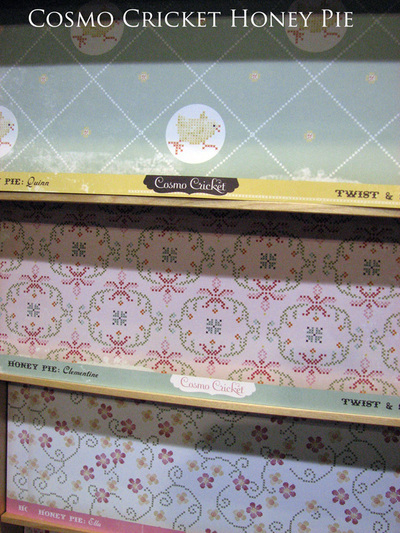 The samples at their booth were so cool and vintage--fabulous! I asked permission to take pictures, so I'm sharing these with you. Keep in mind that these are tiny pieces, for the most part. Isn't this one darling? 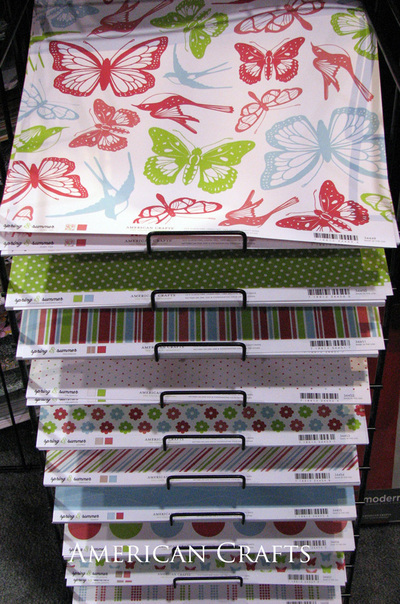 Okay, stampers, think patterned papers here, and stamped images, as well as photographs. Here's another, slightly larger piece. I'm guessing that the rectangles were about 3/4" x 1-1/2". How about one of K&Company's new lines? I *think* that this one was called Awning, but I'm not positive. The "family" piece was made with it--beautiful, huh? 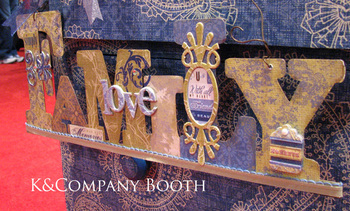 Their booth is always lovely! Finally (since I keep falling asleep typing! ), I'll stop with these Jen Wilson papers from My Mind's Eye--I loved them! With that, I'm off. Have a great day! A Little Peek. . .
Hello from sunny California! I was amazed as we rode a shuttle from LAX to Anaheim to see palm trees juxtaposed against snow-covered mountains in the distance--so lovely! I took very few pictures in the exhibition galleries today (Sunday) because CHA actually starts tomorrow (Monday). I figured it would be highly frowned upon. I did ask permission to snap a couple of pictures at the Cornish Heritage Farms booth and in the Spellbinders booth as they were setting up for opening. 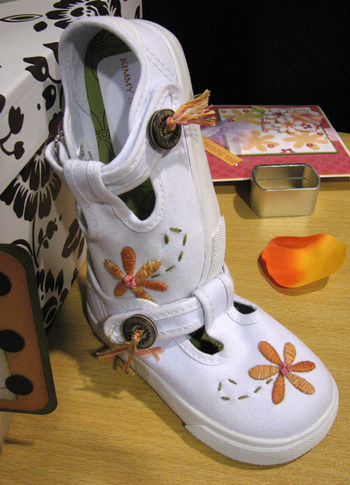 How about these darling little shoes? These were stamped with one of CHF's Kim Hughes sets, then embroidered over the top of that.I'm not positive who made them, but I think it was Anne Sanborne. (If anyone sees this and actually knows, feel free to correct me,and Ill get it changed!) On the inside she has them labeled "Kimmy Sh-Hughes." Do you have kids who watch Thomas the Train? The buzz is that CHF has picked up the rights to manufacture a Thomas line! I can't wait to see those! 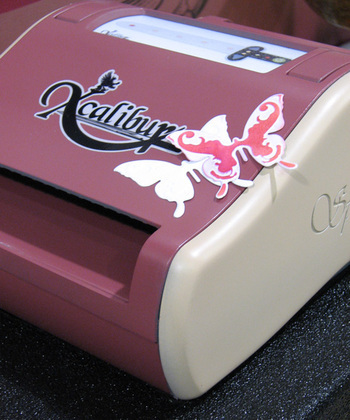 Last, but not least, I saw the Spellbinders X-calibur in action today--no ratcheting! You still send it through once to cut and a second time to emboss, but it did all of the work. I was also able to do some of the design work on a new addition to the Nestabilities line--long rectangles called Megabilities. 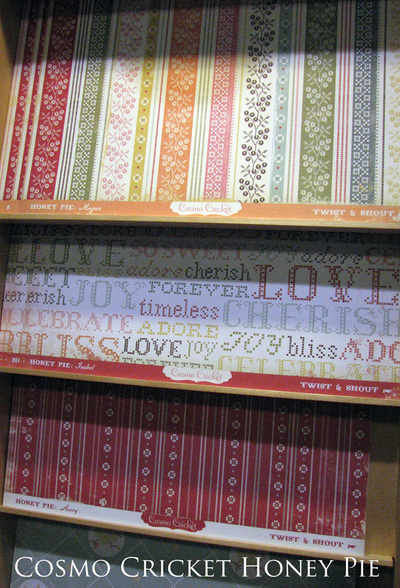 These are SO cool in that they are huge--think scalloped cards around 6" long! More about those in future posts, no doubt. I hope to get bunches of pictures to share today! (If you're wondering about the time frame here, I started this post last night and feel asleep typing. . .) Have a great day! Hi, everybody! I'm sorry that I'm behind on posting, but I am scurrying madly to get some CHA projects finished, and I haven't even finished packing yet! I leave before 6am in the morning--there's plenty of time, right? I was able to borrow a laptop from my sweet friend, and I will try to post from CHA at least once a day. Thanks for stopping! Remember the cottage flowers that I colored for you step by step with Copic markers a couple of days ago in this post? I had a chance to finish the card tonight. A couple of things were changed: I darkened the green in the center of the bouquet because there was still too much white space showing, and I covered the Mason jar with a coating of Judikins Diamond Glaze--very similar to Ranger Glossy Accents and SU Crystal Effects. I also added a smattering of Spica clear glitter pen to several of the blooms to brighten them up. 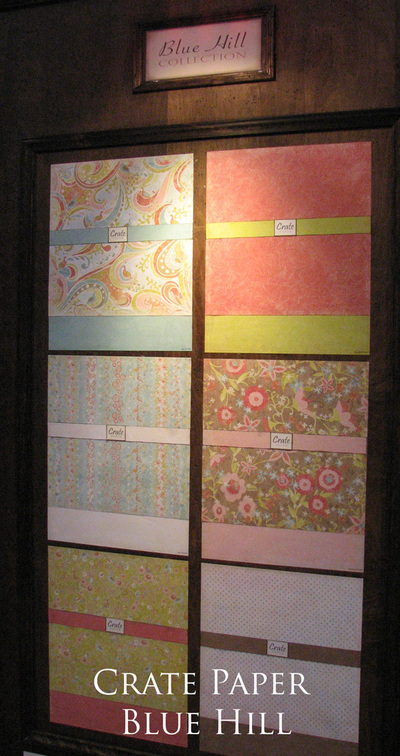 Patterned papers are from Basic Grey's Lily Kate Collection. It seems that I often have the solids in any 6" x 6" patterned paper pad left over after I have used the prints that I like best. For this card, I was glad to have these solid patterns. I think a print might have distracted from the detail in the focal image. Focal image is matted in Prism Spring Willow Medium cardstock and sewn around. 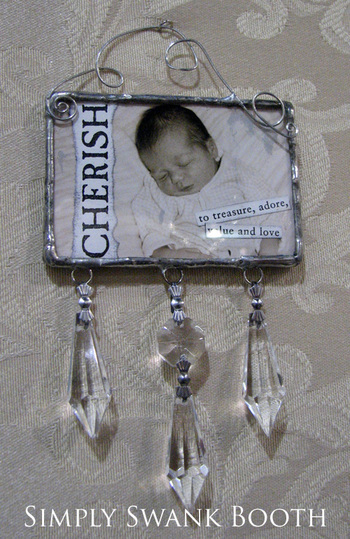 I used my Basic Grey Slot Tool to cut a place for my ivory taffeta ribbon to run behind the image, and I placed antique pewter brads through the center of the little tab. 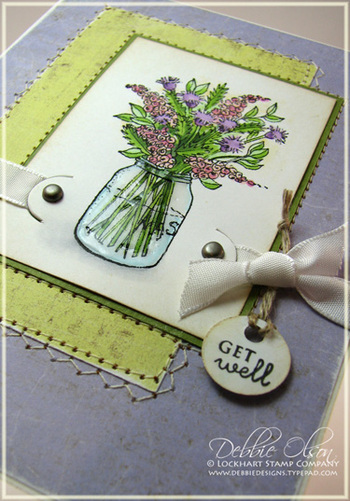 The "Get Well sentiment is from PaperTrey's Mixed Messages--I'm a lover of tiny tags and words, and think that this set is perfect to add words to cards! The tag is hung on a length of linen thread and is held in place by a bit of foam tape behind the tag.